When the Democrats were the majority party at the North Carolina General Assembly, Republicans wanted redistricting reform. Now that the Republicans are at the helm of power, Democrats want redistricting reform. But advocates say gerrymandering is not a partisan issue, and if redistricting reform isn’t passed soon, it will permanently corrode the public’s confidence in elections. Gerrymandering is the manipulation of electoral boundaries to favor one party or class — it’s often discussed in the context of lawmakers using race or politics to draw maps that ensure their election. There are currently five pending cases in the courts that involve allegations of racial and partisan gerrymandering in North Carolina. “I believe this is the critical issue of our time,” said Ira Botvinick, an independent Raleigh voter. 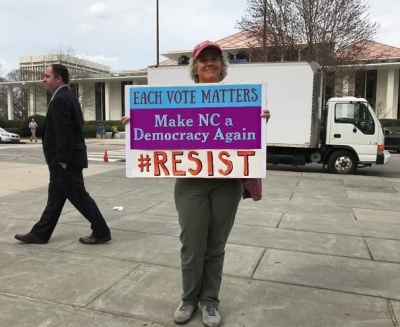 Botvinick was one of hundreds who either went to the legislature Thursday to lobby lawmakers to end gerrymandering or turned out at a rally for the same cause in front of the Legislative Building. He said gerrymandering is not what democracy is about and that the end result of drawing legislative and congressional maps should be to maximize opposition, not favor the majority party. Rep. Chuck McGrady (R-Henderson) is urging legislative leaders to back HB200. A bipartisan group of lawmakers introduced House Bill 200 earlier this week in an effort to end gerrymandering and take the politics out of redistricting, as much as that is possible. Rep. Chuck McGrady (R-Henderson) led a press conference encouraging legislative leaders to get behind the bill and allow it to be heard in committee. Instead of lawmakers drawing their own districts for partisan advantage, HB 200 would make it so that a nonpartisan legislative staff would create congressional and legislative maps blind of political consideration. The bill would take effect for the 2021 redistricting cycle. Under North Carolina’s current and longstanding law, the majority party in the legislature controls redistricting. The result, according to Common Cause North Carolina, has been voting maps that heavily favor one party or the other and reduced competition on the ballot. Since 1992, nearly half of all legislative races have had just one candidate on the ballot. Last year, only a tiny percentage of winners in legislative and congressional races had victory margins in the single digits. HB 200 would require the nonpartisan legislative staff to follow strict guidelines when drawing voting districts, without input from lawmakers. Maps would then be sent to the full legislature for an up or down vote. The process is patterned after the impartial redistricting plan used successfully in Iowa since 1980, according to Common Cause. Unfortunately for the proponents, it appears that getting legislative leaders on board will be an uphill battle. Phillips said they haven’t been receptive to conversation about redistricting reform. “I think leadership probably doesn’t take it too seriously,” he said. 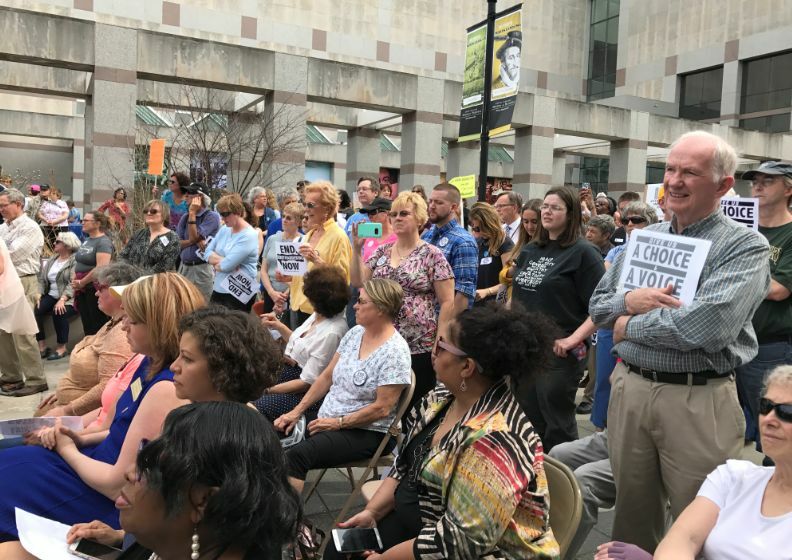 Phillips added though that the community response to the legislative lobby day events Thursday was unlike anything he’d seen before — 800 people registered and even more showed up to talk to lawmakers about ending gerrymandering. He said he thinks the turnout is reflective of the frustration felt by North Carolina voters. It should be noted that HB 200 is almost identical to 2011’s HB824 — which passed the Republican-led House at the time. House Speaker Tim Moore voted for the bill in 2011 and has supported redistricting reform no less than four times. Senate President Pro Tem Phil Berger has sponsored redistricting reform legislation in the past. Mitch Kokai, a senior political analyst at the conservative John Locke Foundation, said at the press conference announcing HB 200 that the organization was glad to see some action on redistricting reform. “This is a good government issue and it should be pursued no matter who’s in charge,” he said. Kokai added that he was particularly happy to see Republicans sponsoring the bill because it’s easier to support for those in the minority party but more difficult for the majority to give up their current power for long term benefits. McGrady is sponsoring the bill, along with Representatives Jonathan Jordan (R-Ashe, Watauga), Jon Hardister (R-Guilford) and Sarah Stevens (R-Surry, Wilkes). There are Democrats co-sponsoring the bill as well. 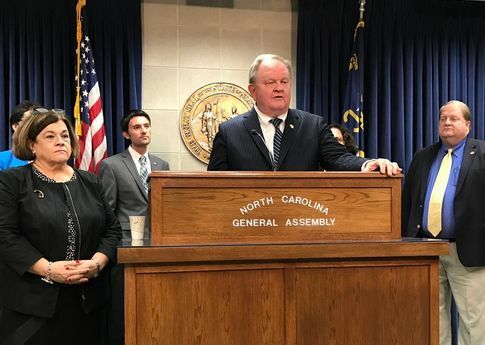 He did clarify, “for the record,” that from his perspective, supporting HB 200 is not an affront to the current legislative districts being challenged in court. “I believe, speaking for myself, that those districts are constitutional, but I would submit that there’s a better way for this process to be done,” Hardister said. A majority of North Carolinians support independent redistricting, according to a January survey from Public Policy Polling. It found that 59 percent of voters are in favor of making the map-drawing process nonpartisan. 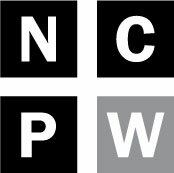 Jane Pinsky, director of the nonpartisan NC Coalition for Lobbying and Government Reform, said the time for the issue to gain traction has arrived. “North Carolinians are tired of the endless controversy around redistricting and they are saying ‘enough is enough,’” she said. She was also offended Thursday when Rep. Bert Jones (R-Caswell, Rockingham) ignored her and about four others waiting to talk to him about redistricting reform. She had hoped for better manners from her elected officials, but she said she also didn’t set too high of expectations. “We know that this place is fun of complacent Republicans who believe they don’t need us,” she said. Pepper said she wants a redistricting process that is blind not only of politics but also of race and socio-economic status. She’s not sure North Carolina will get there, but she wants to help however she can. Reuben and Betty Pettiford, voters in Fayetteville, also showed up for legislative lobbying day. His wife said she feels like their votes are being diluted to favor the majority political party. “To them, our vote is a matter of self-defense,” she said. They were both “encouraged and heartened” by the turnout Thursday, noting that the crowd at the rally was respectable, but that they’d also hoped for more people. There were a lot of speakers at the rally and the crowd was engaged. Sarah Gillooly, Policy Director of the American Civil Liberties Union of North Carolina, spoke about voters’ rights and how they’re affected by gerrymandering. Gillooly said the outcomes of elections aren’t reflecting that and that some votes count more than others, thanks to gerrymandering. Other speakers from advocacy organizations said gerrymandering effects everyone because it prevents voters from electing lawmakers who will work for what they care about. 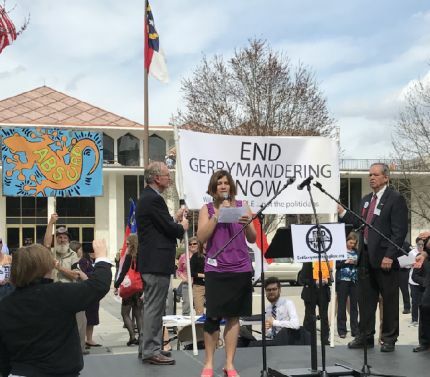 Tara Romano, Executive Director of NARAL Pro-Choice North Carolina and President of North Carolina Women United, said gerrymandering makes voters feel like the system has been rigged against them. “Is this what democracy looks like?” she asked. Romano said redistricting reform is a key component of citizen advocacy, no matter the issue. It’s not clear how far HB 200 will go this session, but McGrady has indicated that he’s willing to negotiate for independent redistricting. “I’ve always said about the redistricting issue that there’s going to be a time when Republicans and Democrats both feel like it’s in their best interest to move a bill like this, and I want to have a bill ready and cued up to go when that time occurs,” McGrady said.